February 5: Ju Ju at LaSalle-Backus Education Campus (DCPS) — Teach the Beat! 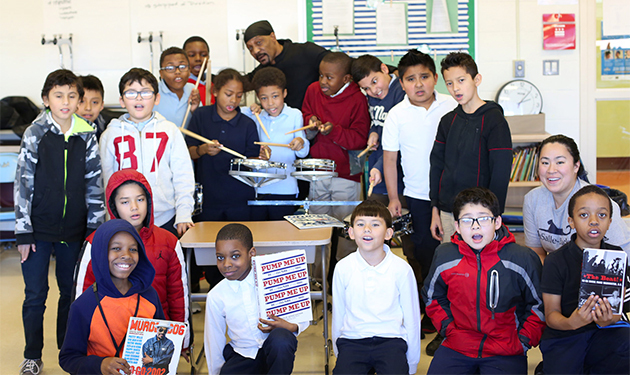 LaSalle-Backus Education Campus (DCPS) music teacher Rebekah Cabaltica and twenty-five of her students (all boys) from grades 4-8 participated in an engaging workshop on go-go music facilitated by legendary go-go drummer, Ju Ju House. The session started with students creating a rhythm by clapping their hands and stomping their feet in response to Ju Ju’s command. Students were then divided into groups of four and given the opportunity to create their own band names. Inspired by artists they like students developed names such as Little Savages and Gucci Sanic. Each group was then brought up to the front of the room and with guidance from Ju Ju students were given an opportunity to play an instrument. Excitement filled the air as each team had their turn to play and compete against one another. As part of the Black Lives Matter Week of Action in Schools, this session was organized by Teaching for Change, and is connected to the guiding principle of Intergenerational, Black Families, and Black Villages.